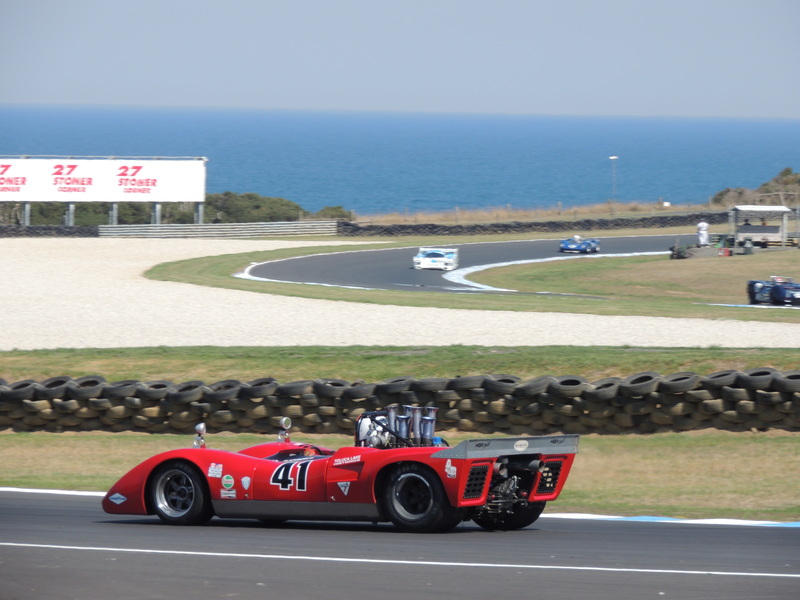 Horsepower and heat were the themes of this year’s 24th running of the Phillip Island Classic, 8-10 March. 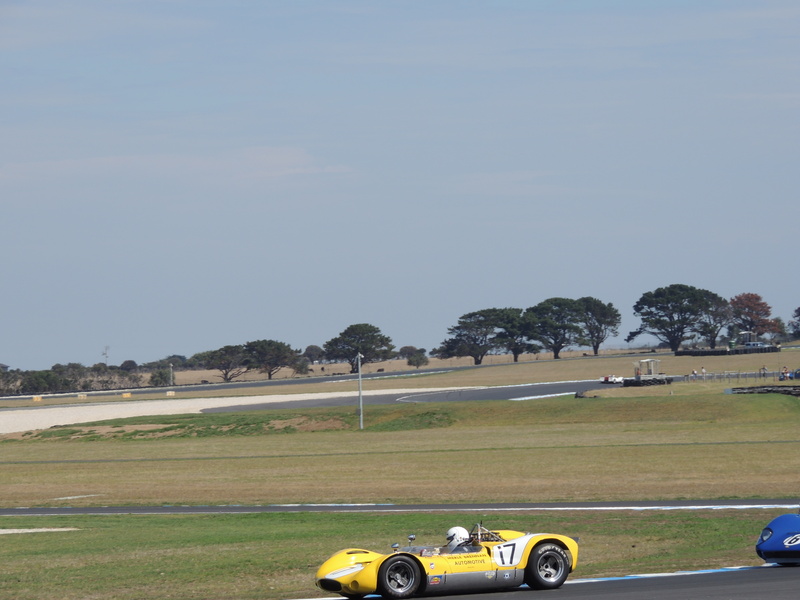 Victorians suffered through a record run of above 30 degree days, with the Classic in the middle, but the heat got to some more than others with Rusty French suffering an engine fire in the final Group Sc production sports car race in his De Tomaso Pantera GTS. Lap records also fell during the weekend, helped by the new track surface and increasing grip levels every race as more rubber was laid. This was particularly so out of MG corner with Michael Lyons wheel-spinning each lap when changing gear. 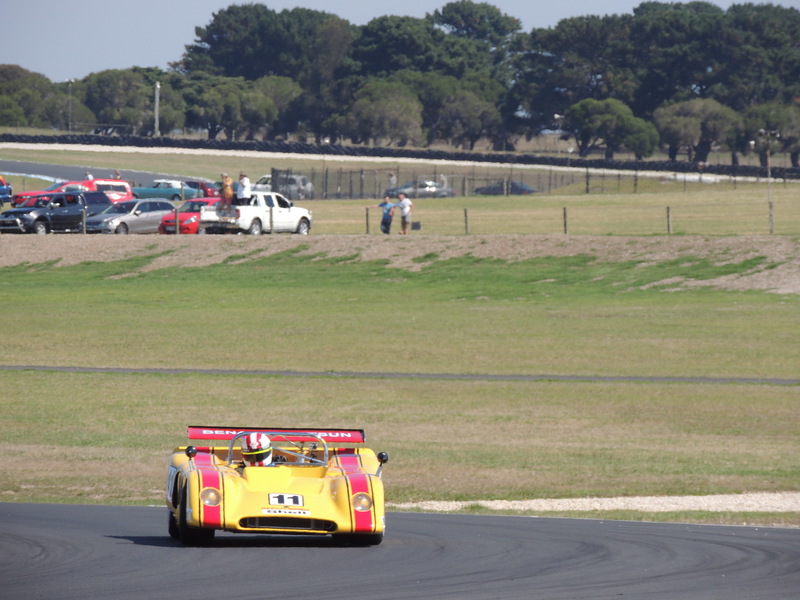 The Group Sa & Sb production sports car races put on some good battles across the weekend. 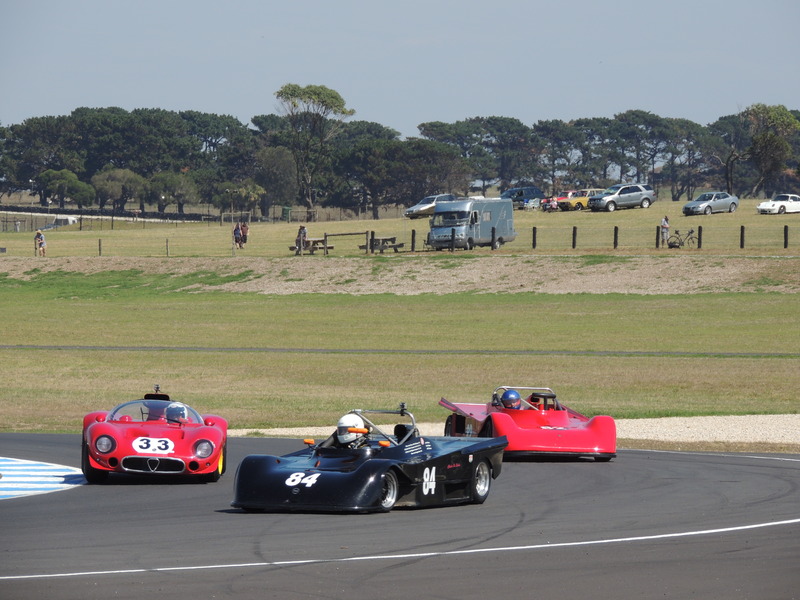 In race 1 Troy Ryan (1963 Austin Healey Sprite) got off to a slow start, Alex Webster (1967 Porsche 911S) got a terrific start, however, and led the first two laps. 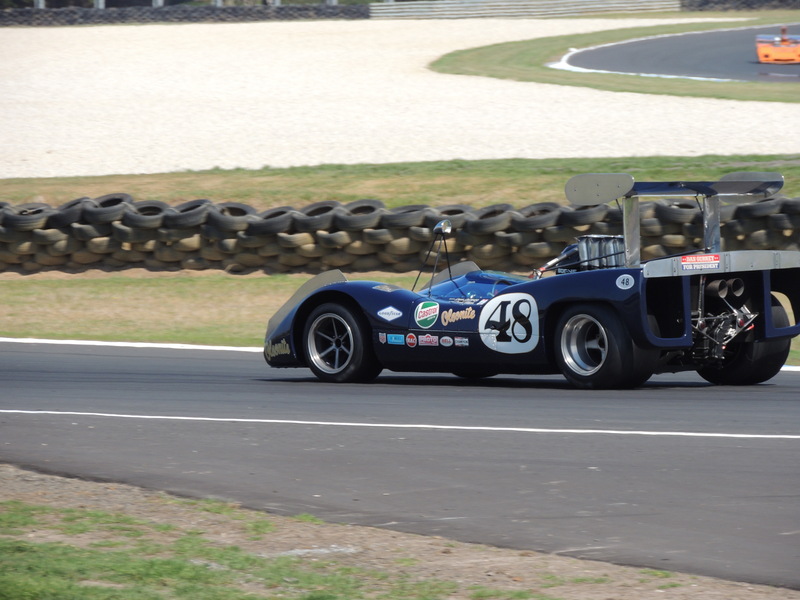 Damien Meyer (1970 MG Midget) failed to finish three laps, breaking down at Honda corner. With Peter Jackson (1959 Austin Healey 3000) keeping the front duo honest, Ryan took back the lead, with Jackson moving into second. Oefinal lap though, all went wrong for Ryan who spun at Siberia, Jackson held the lead for an all-too brief period as Webster got past at Siberia and held on to this to take out the race by 400ths of a second. Race 2 was a different affair with Ryan out to settle the score from race 1. Jackson had the lead on the final lap, but locked brakes into MG corner on the final lap. This helped Ryan gain momentum on to the main straight, slip-streaming Jackson to take a narrow win. Graeme Rutledge (1971 Triumph TR6) took a gallant third place from Webster, while Meyer charged hard through the field to take 6th place from rear of the grid. Andrew Gibson (1960 Triumph TR3A), though retired on lap four with a broken crankshaft. 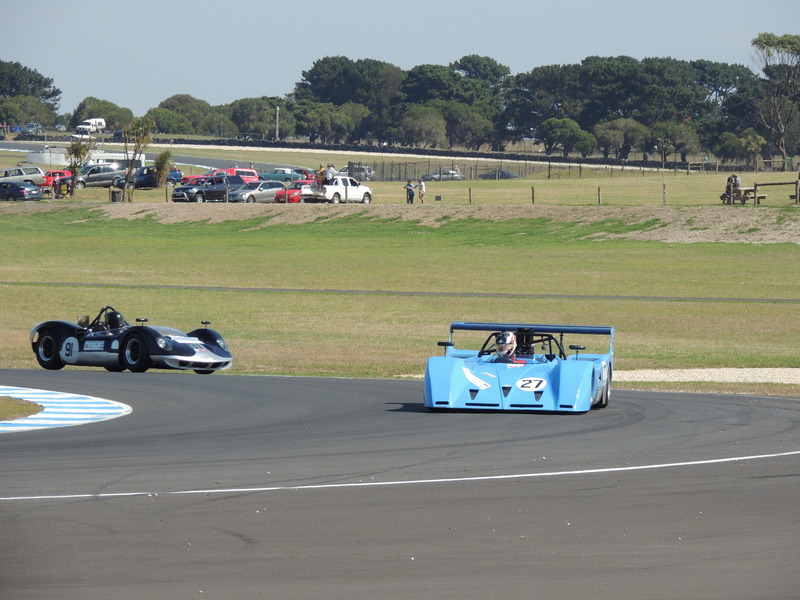 In the Group Sc production sports car race 1, French had sorted out the dramas he had at the 2012 Tasman Revival to hold off a challenge from Geoff Morgan (1975 Porsche 911). 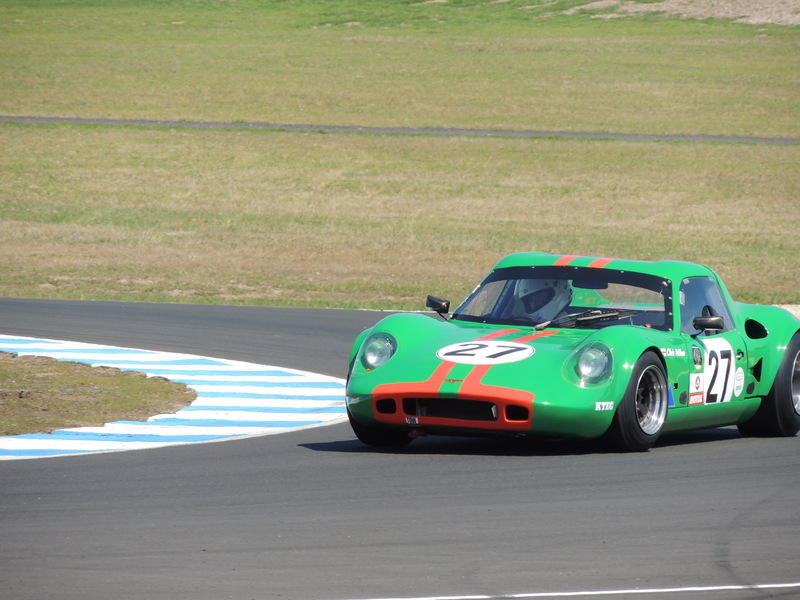 French broke the lap record for his class with a 1.48.09, and Laurie Burton (1969 TVR Tuscan) was in a Shelby sandwich breaking up the Shelby Americans of George Nittis and Ian Ross. The Group S field was altered on the Sunday with the final two races been for division 1 & division 2. 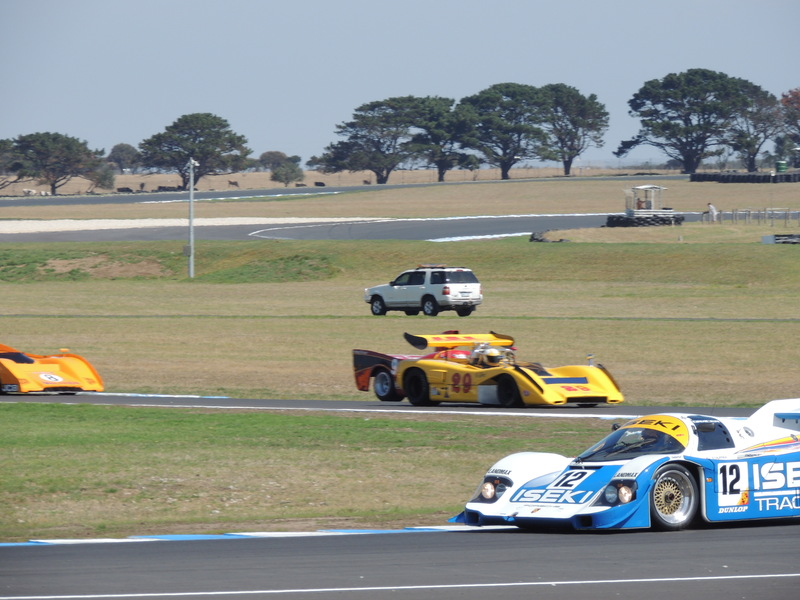 The division 1 race in the morning again proved entertaining to watch, this time with Michael Byrne (1975 Lotus Super 7 S4) joining the action from Group Sc. Ryan and Byrne battled race long, each lap Byrne taking Ryan at turn 1, then back and forth. 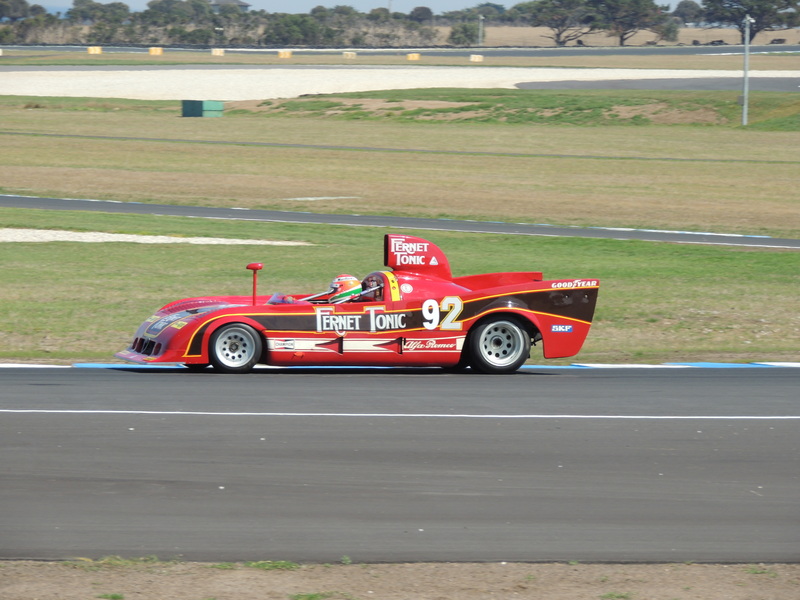 Byrne measured Ryan up by the last lap and used the torque of the twin-cam engine to pull away from Ryan on the final lap to take a great hard-fought win by 30 metres. Ryan got a consolation prize with a new lap record on lap 3 with a 1.55.60. The Groups J, K & Lb races proved once again to put on a diverse range of pre & post war racing. David Reid (1959 Faux Pas) got off to a bad start from the second row, with Grant Craft (1955 Sharp Holden) making up for this from the third row to second place by turn 1. This wasn’t to last though with Craft retiring and Rod Jolly (1958 Monza Lister Jaguar) storming home to an easy finish. Roger Ealand (Gemini Mk3A) suffered handling problems, but managed to hold off Scotty Taylor, who had brought out his Cooper Bobtail this year. The scribe followed the final race with note taking, and noted that Ray Sprague must not have got CAMS approval for the fox-tail (presented to him at the February VHRR meeting), so the 1952 Ford Roadster was somewhat down on aerodynamics! Jolly entertained the crowd with exacting power drifts on to the main straight in the Monza. Paul Trevethan steered Greg Smith’s MG Holden Special, while Paddins Dowling competed in his glistening 1939 Maserati 4CL. The bug-eye Sprites of Fred Brock and Max Pegram diced all weekend for the very minor places, but showed you can have a ball anywhere, as long as you’re out there. 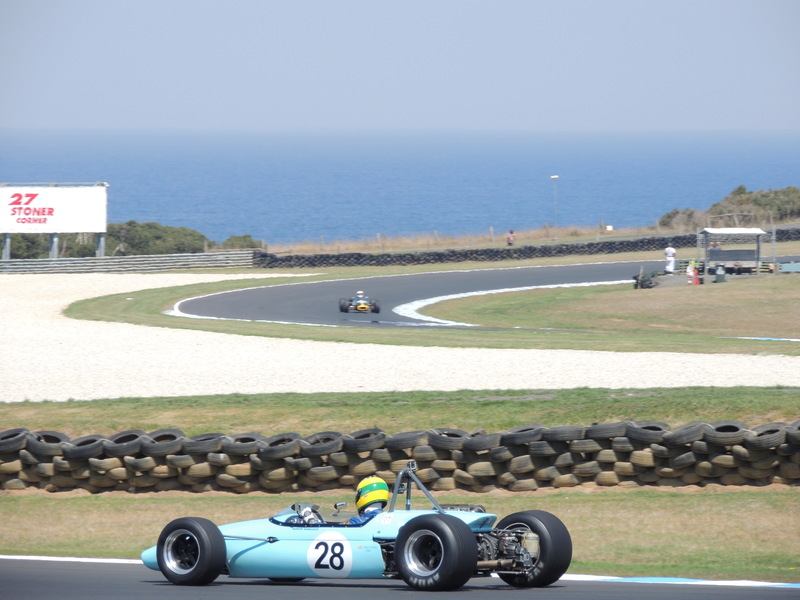 The Formula Ford racing across the weekend provided good spectating. 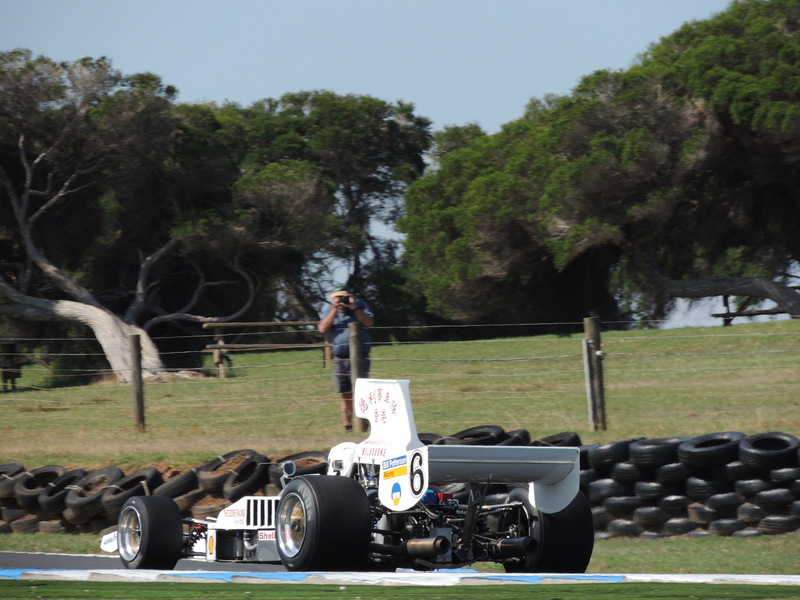 The scribe took notes on race 2, Tim Blanchard (1988 Van Dieman) and Jonathan Miles (1982 Van Dieman) tangled on lap 4, but Blanchard came back through the pack to finish fourth. A three-way battle for a few laps between Nick Bennett (1988 Van Dieman), Anthony Mann (1986 Van Dieman) and Andrew McInnes (1989 Van Dieman). On the final lap McInnes pulled out of the toe on the straight, but got pipped narrowly by Bennett who took a close race win. 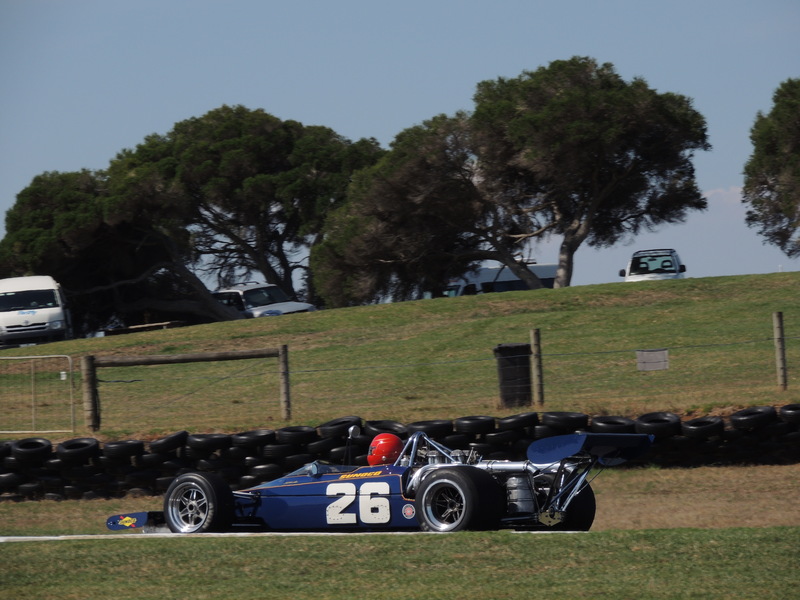 David Holland took third in his Reynard with Mann relegated to fifth. The Group C & A Touring car events moved into a new era with the re-naming to ‘Heritage Touring Cars’, and went back to the past with the return of Mark Skaife to the Group A field, in a Gibson Motorsport prepared 1990 Nissan HR31 Skyline. Todd Martin again joined Darren Knight in commentary for these races, so the scribe felt it hard to keep up with note taking from Martin’s call. Race 1 saw Robert Marshall (sister HR31 Skyline) spin at Honda corner on lap 4. The Ford Sierras of Bryan Sala and Terry Lawler then battled for second. 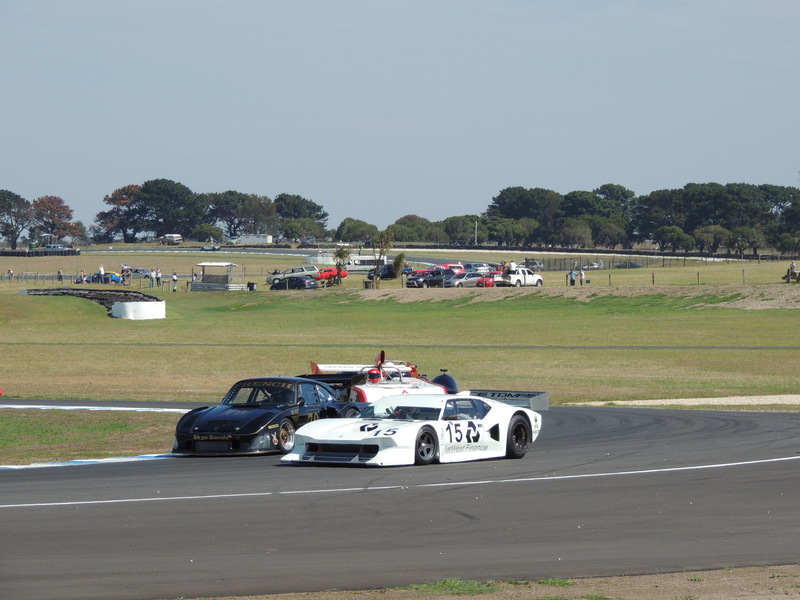 Skaife dominated with a daylight lead and a new lap record of 1.41.44, with Lawler pulling away from Sala in the ex. Colin Bond car. Bill Cutler took the BMW M3 honours from Jervis Ward and David Towe, Ward suffering from a dodgy brake rotor. Race 2 saw a similar finish. Skaife sat out race 3 with a prior commitment, thus allowing for another winner to come fourth. Race 3 saw Sala take the lead on lap 2, and pulled away to win the race 5 seconds ahead of Rod Markland (1991 Nissan Skyline GTR) with Luke Ellery (1985 Nissan Skyline) some 7 seconds further back for third. Race 4 and Robert Singleton (1982 Holden Commodore) and Adrian Allisey (1982 Holden Commodore) came together at MG corner on lap 1. Lawler advances to second place overtaking Markland on lap 2. Skaife to fifth place by lap 3 (from rear of grid). Lawler overtakes Sala at Lukey Heights for the lead on lap 3, Sala then threw away second place on lap 4 by spinning at Honda corner. Ellery harasses Bill Cutler (1987 BMW M3) on lap 5, with Sala coming back on the charge. Ellery finally gets past Cutler on lap 6 at Honda corner. Skaife re–sets his earlier lap record with a 1.40.23, finishing some 2 tenths of a second behind Lawler, who had his maiden race win in the Sierra. In the Group M & O Racing car field, Damon Hancock (1967 Brabham BT23C) broke one of the longest standing class records in race 1. 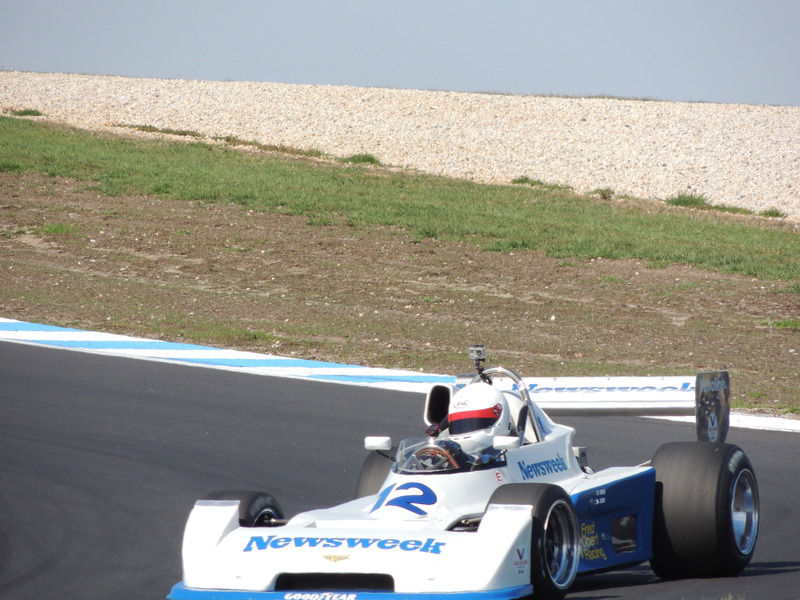 The late Bib Stillwell (1969 Brabham-Repco BT31 – now campaigned by Peter Strauss) broke the then lap record at the 1991 Classic meeting with a 1.38.45. Hancock eclipsed this during the first race with a 1.37.29, and the race win. It’s not the fastest the car will go either, still pulling away on the main straight at 10,000 rpm! 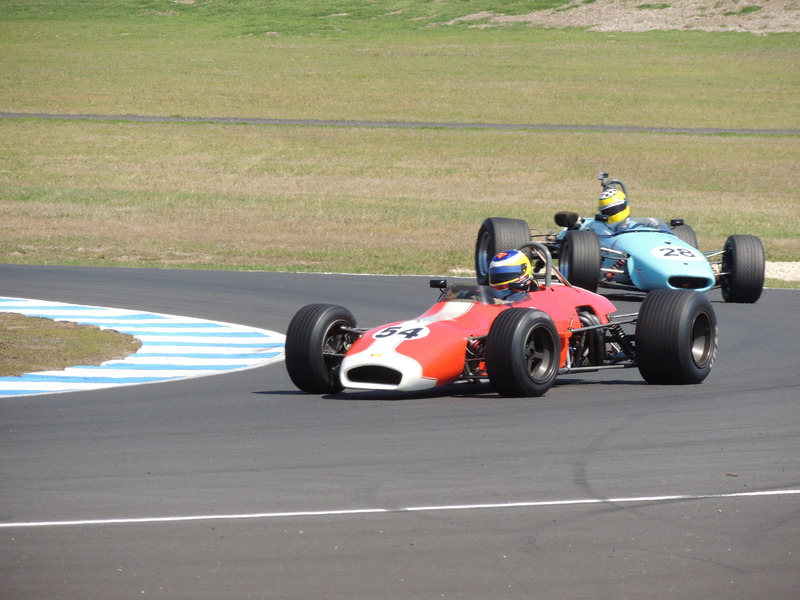 Ray Stubber came second in that first race in his 1969 Brabham BT29. 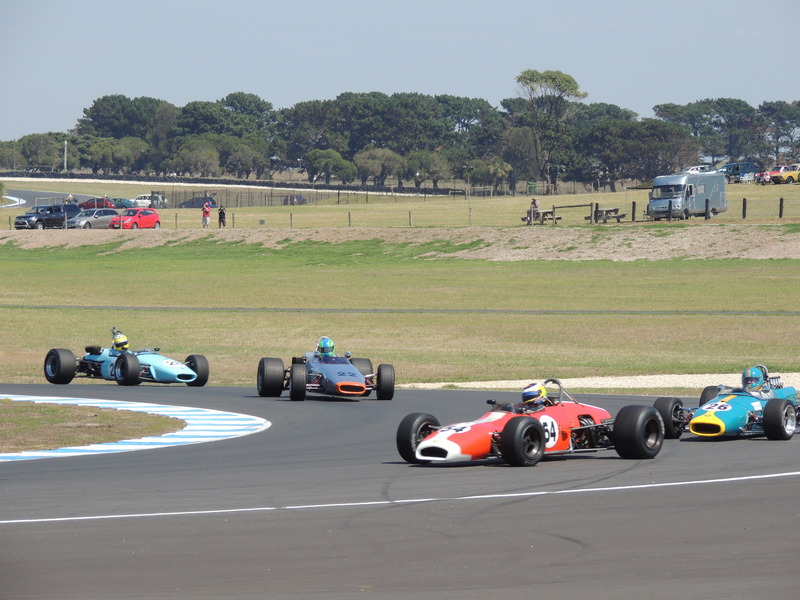 Strauss kept on Keith Simpson’s 1966 Brabham BT16) heels who took third place in race two for the Penrite stable. Unfortunately race 3 led to a retirement (for race 4) by Strauss who finished with 7 cylinders, and a bent valve. For Stubber, though it was a terrific race with him lowering the Hancock lap record from race 1 with a 1.36.86 against Hancock’s 1.36.90 on lap 3. Neither could get that pace back in race 4, but Hancock took home the rare prize from the weekend with four wins from four starts. 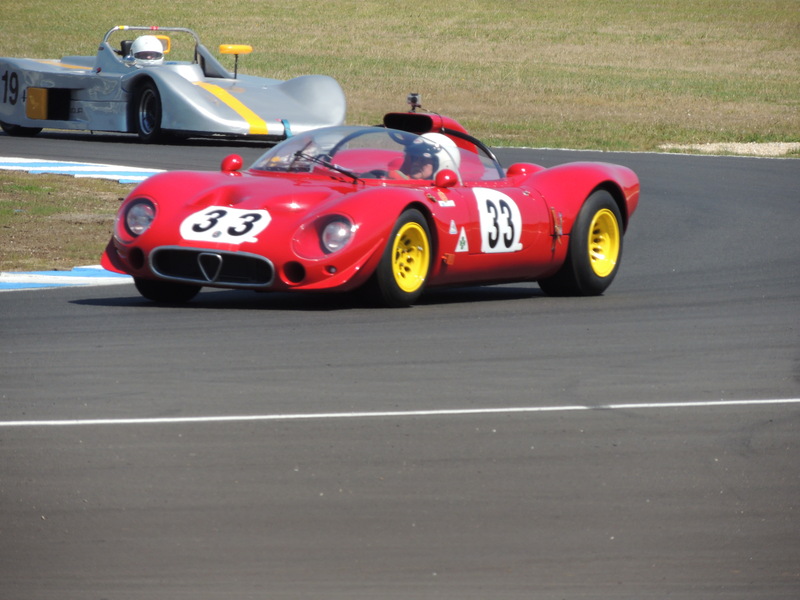 Andrew Golde made up the last place on the podium in his 1968 Elfin 600, the first time across the weekend the Elfin broke up the Brabham dominance. Bob Harborow pulled off a great achievement and spectacle with the procurement of so many cars from overseas for this event. 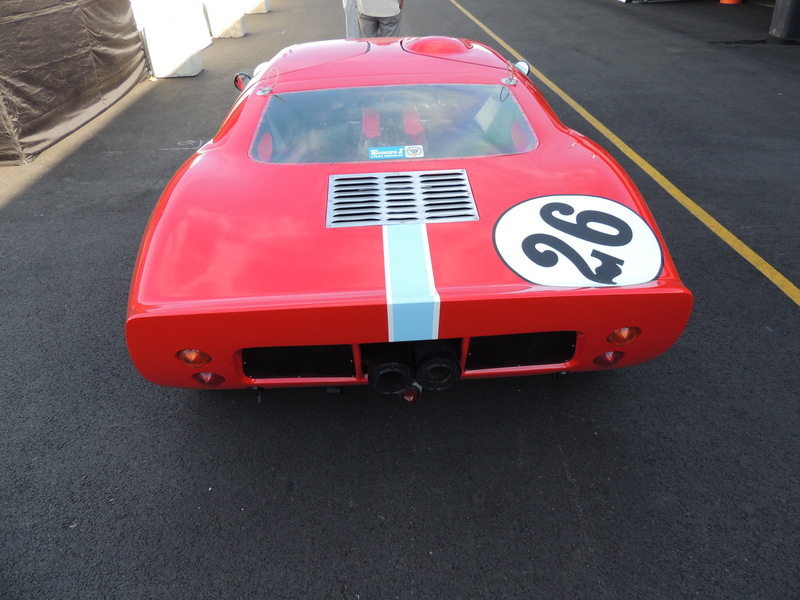 The cars included Can-Am, Group 7 and LeMans specification cars from the 1960s-1980s. The Porsche factory’s involvement in the Classic meeting in recent years increased this year with the supply of their 1981 Porsche 936, in which Jacky Ickx and Derek Bell won that year’s Le Mans 24 hour race. Alex Davison was a late receiver of the task to drive this very valuable piece of machinery. 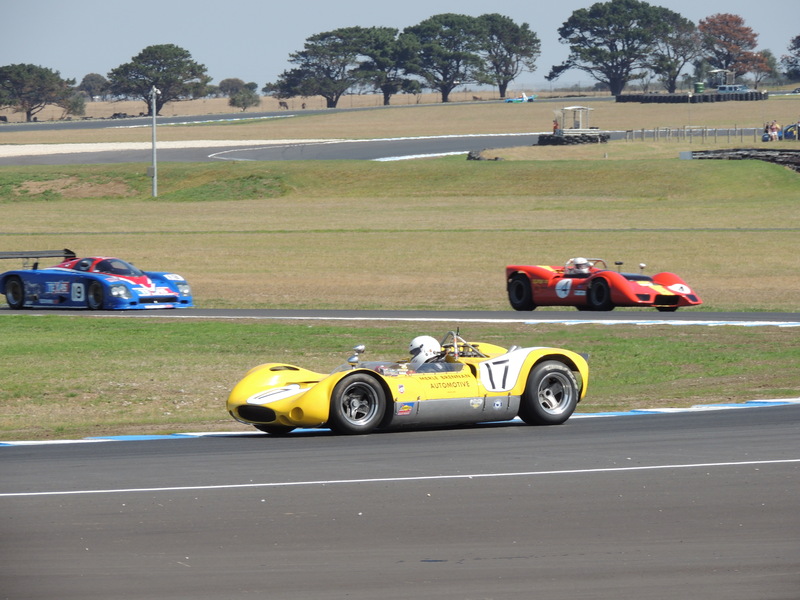 There were many representatives from the “Bruce & Denny show” era, with a 1965 McLaren M1A, a trio of 1966 McLaren M1B, 1968 McLaren M6B, 1970 McLaren M8C, 1971 McLaren M8F and the 1971 McLaren M8E. 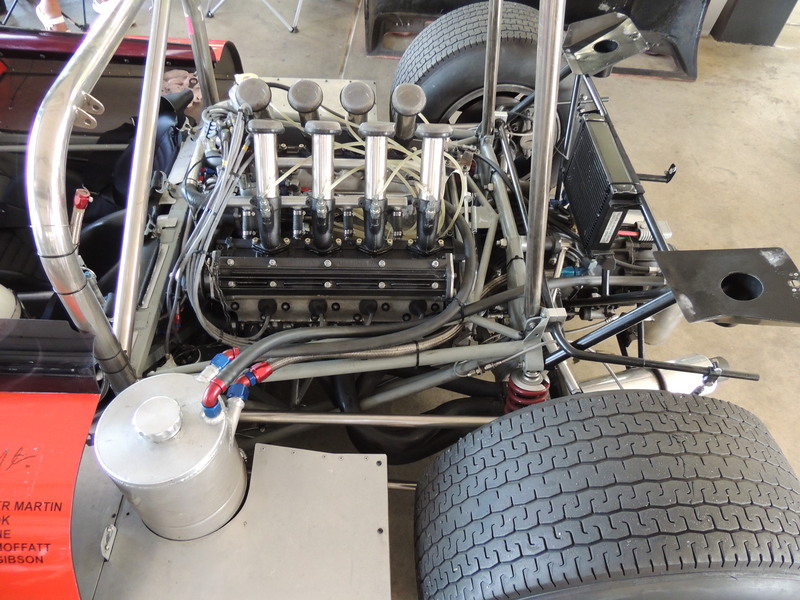 These were supported by an equally impressive contingent of local and overseas based Lola cars, including Aaron Lewis’ race track debut of his 1969 Lola T163, which has a small (compared to some in the event) 8300 cc engine, producing 834 bhp on the dyno. The Le Mans contingent was supported with three more Porsche cars; 1979 Porsche 935 K3, 1984 Porsche 956C and 1988 Porsche 962. The latter owned by Peter Harburg, who also had an Aston Martin DB2 & ex-Bib Stillwell Jaguar D-Type at the meeting (need something to drive through and from the accommodation in!). 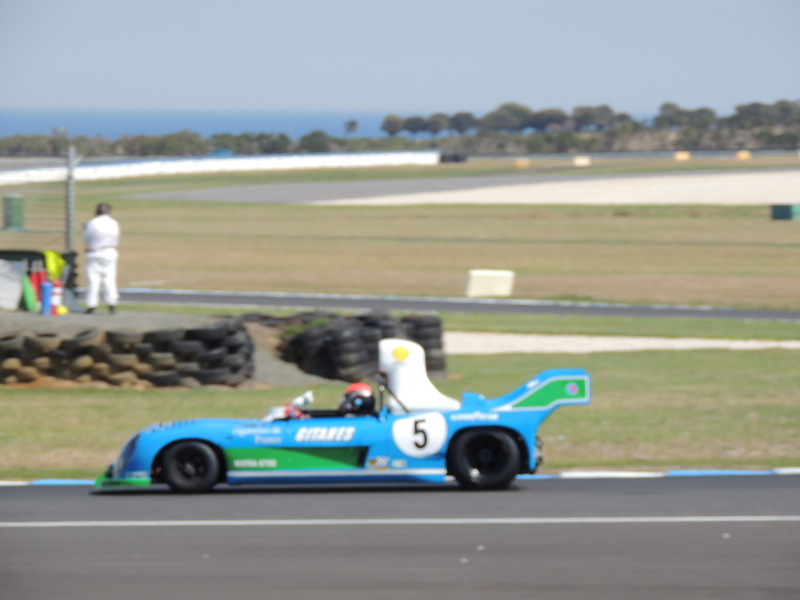 The contingent was further supported by the two Matra-Simca 670C, which were driven by Rick & Rob Hall. 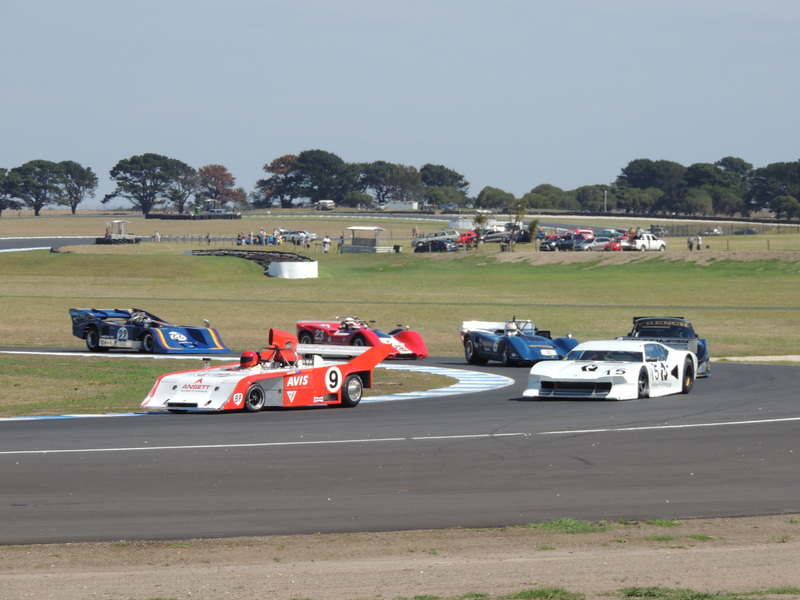 There is always a cat amongst the pigeons when it comes to a gathering like this, and that was provided by the 1973 March 717, a one-off Group 7 car, which was given by its owner to Michael Lyons for his trip downunder. 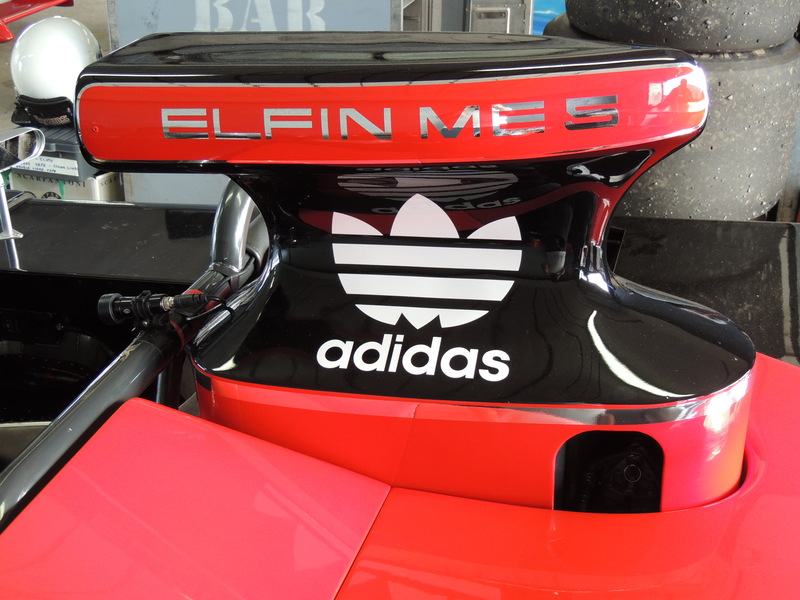 Australia was represented by a brace of Elfin cars, as well as te Graduate and Rennmax. 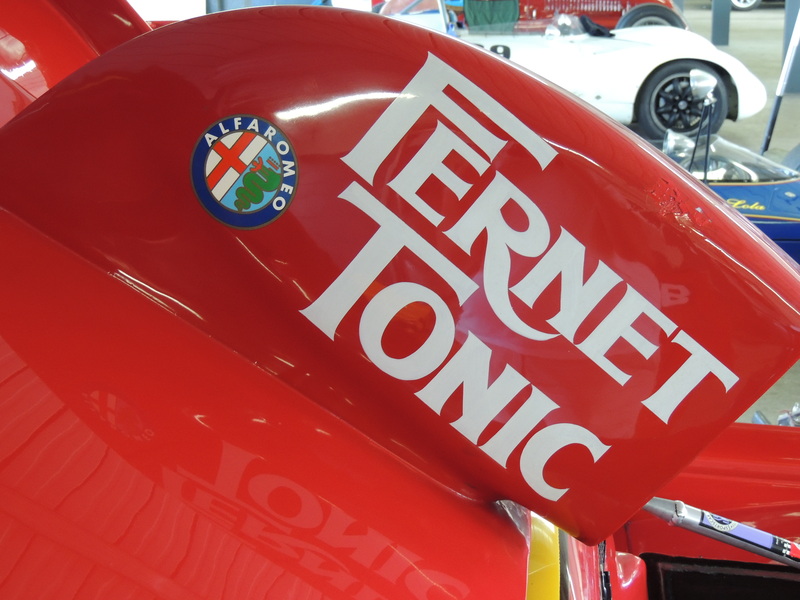 Lyons set the pace in qualifying with a pole position time half a second faster than the next three positions, which were within half a second of each other. 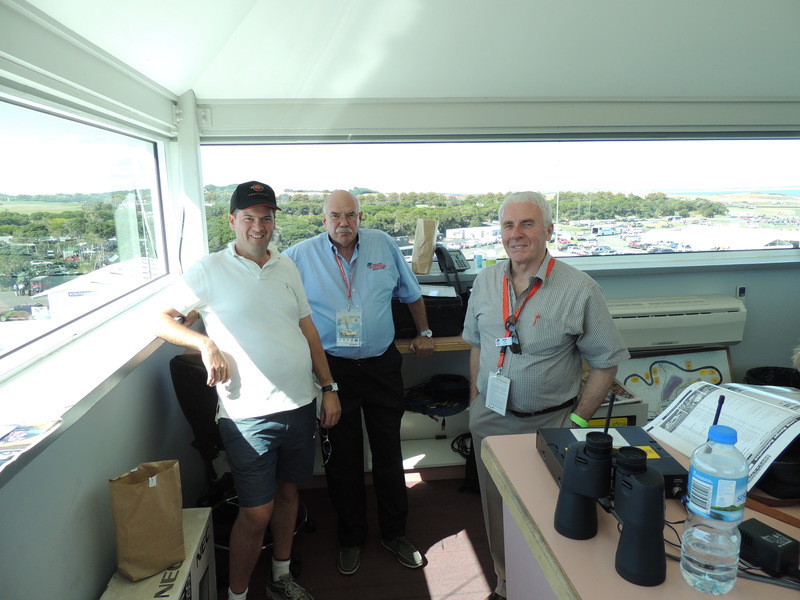 Kempnich, Mackellar & Rick Hall. 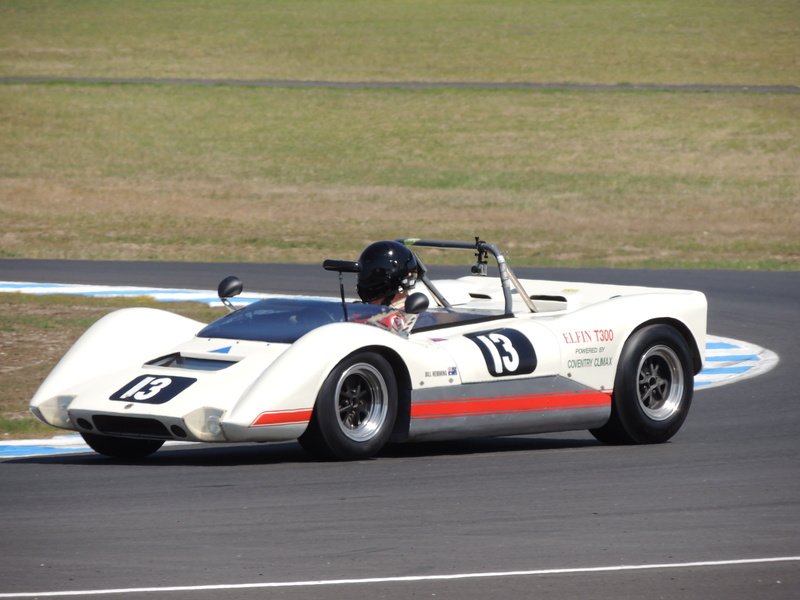 Frank Lyons was a non-starter for race 1 with a blown engine in his 1969 Lola T70 Coupe. Dan Cowdrey lost a wheel coming out of MG corner on lap (broken hub) 4 in his ex Donahue, Roger Penske Racing 1966 Lola T70 .Spyder, and this subsequently made the race finish under a safety car. The feature race on Sunday was to be a 20-lap endure, but the grid were granted permission by the organisers to shorten the race to 15 laps. Lyons was again dominant, eventually winning by some 47 seconds to the nearest. French and Davison had a good dice in their Porsche cars. Rob Hall got from rear of grid to 7th place by lap 4. Davison and Hall both then got past French. By mid race Kempnich moved up to 3rd and Rick Hall up to 4th. 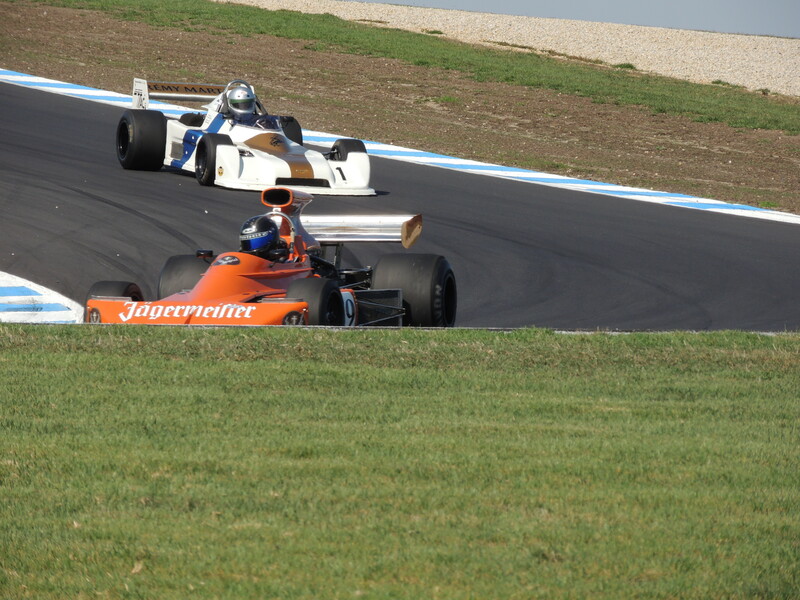 Andy Newell (McLaren M8F) retired on lap 4 with an oil issue, as did Rob Tweedie (Elfin MS7). By lap 8 Rob Hall had got the Matra Simca on the tail of Rick’s sister car, but eventually settled back a bit to take 4th. The finish saw the podium: 1st Michael Lyons, 2nd Russell Kempnich and 3rd to Rick Hall.